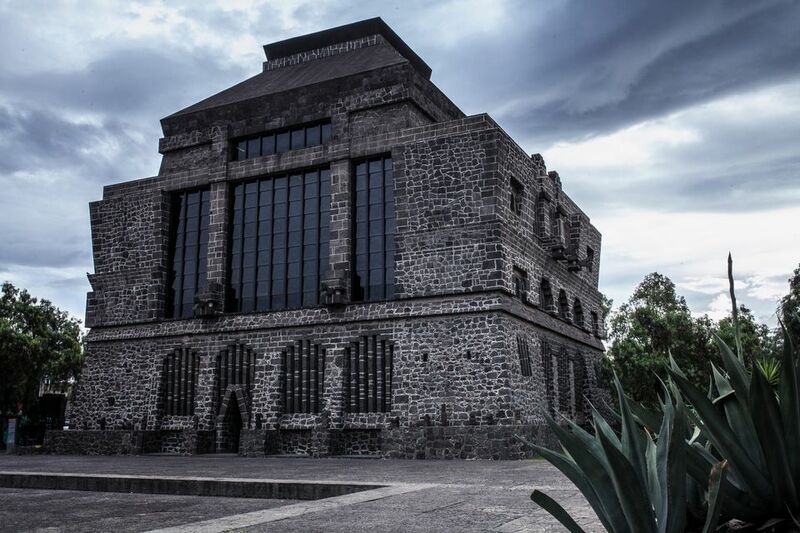 The Museo Diego Rivera Anahuacalli Museum in Mexico City was designed by Mexican artist Diego Rivera to house his massive collection of pre-Hispanic art. The name Anahuacalli means "house surrounded by water" in Nahuatl, the language of the Aztecs. On a visit to this museum, you can gain some insight into a different aspect of Rivera apart from his muralism work: you can see his interest in pre-Hispanic art and culture, and architecture. Along with the Dolores Olmedo museum where you can see some of Rivera's paintings on canvas, particularly some of his earlier work, this is a great place to get some insight into the artist's thinking beyond his mainly politically-themed murals. Rivera and his wife Frida Kahlo bought the land the museum is located on in the 1930s with the intention of creating a farm, but over time they decided to build this temple-museum hybrid here. Rivera had a huge collection of pre-Hispanic art with over 50,000 pieces at the time of his death. Some 2000 pieces are on display at the museum at any time. Reportedly, he was troubled to see ancient Mexican art leaving the country and wanted to collect as much of it as he could and maintain it within Mexico, and ultimately have it on display for people to enjoy. Rivera designed the museum himself, demonstrating his interest in architecture, a little-known side of the artist. He worked with his friend Juan O'Gorman who was also both a painter and architect. The building is made out of the volcanic rock that is prevalent in this area which is also known as "El Pedregal" (the rocky place), due to the eruption of the Xitle volcano. The design drew inspiration from the architecture of ancient Mesoamerica, as well as some of his own personal touches. He somewhat jokingly called the architectural style of the building "Teotihuacano-Maya-Rivera." In some ways, the building resembles a pre-Hispanic pyramid, but it has a spacious interior and many rooms. The building itself is full of symbolism. The ground floor of the building represents the underworld. It is very dark and cool and has depictions of the gods that ruled this plane. The second floor represents the terrestrial plane and contains figures that are involved in daily activities. The third floor represents the heavens. From the terrace on the top floor, you can enjoy beautiful views of the surrounding area. He envisioned this as a sort of community center, which he called "Ciudad de las Artes" (City of Arts) a space where architecture, music, theater, dance, and crafts could coexist, with a large plaza in front of the building which serves as a space for concerts and theatrical and dance performances. The building itself contains a large light-filled space which was originally intended to function as Diego Rivera's studio. In this space, the plans for Rivera's mural "Man at the Crossroads" are now displayed. The mural was originally supposed to be at the Rockefeller Center in New York City but was destroyed because of an argument between Rivera and Nelson Rockefeller about including a portrait of Lenin in the mural. The construction of Anahuacalli was still incomplete at the time of Rivera's death in 1957 and was finished in 1964 under the supervision of O'Gorman and Rivera's daughter Ruth, and made into a museum. The Anahuacalli museum, along with the Museo Frida Kahlo, which is also known as the Blue House, are both held in a trust that is managed by Banco de Mexico. Diego Rivera's wish was that both his and Frida Kahlo's ashes be interred here, but upon his death, he was buried in the Rotonda de las Personas Ilustres in the Dolores Civil Cemetery, and Frida's ashes have remained at La Casa Azul. The Anahuacalli museum is located in San Pablo Tepetlapa, which is in the Coyoacan borough in the southern part of the city, but not particularly close to the historic center of Coyoacan or the Frida Kahlo museum. On the weekends there is a bus service called the "FridaBus" that offers transportation between the two museums. Admission to both museums is included in the cost, 130 pesos for adults and 65 pesos for children under 12. By purchasing a ticket to either Anahuacalli or the Museo Frida Kahlo, you will also get admission to the other museum (just keep your ticket and show it at the other museum).